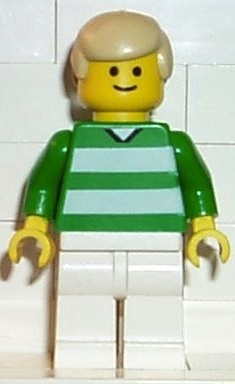 A Green and White Team Player is a minifigure from the Soccer/Football theme. A total of nine minifigures are on this team. The players on this team all have plain white leg pieces, and a green torso piece with green arms and yellow hands. The torsos feature printing on both sides- on the front, two thick horizontal strips run across the jersey, and at the top of the piece, a "v" neckline is outlined in black, with white above the collar. On the back of the torso is the player's number in white and outlined in black. Each player also has a yellow headpiece, with differing printing and hair piece combinations. The player with the number 2 on his back has a headpiece with black printing for two dot eyes and a smile. He also has a standard male hairpiece in brown. This player has a red headband outlined in black, with black hair printed around it. He has two dot eyes and a smile also in black, along with four black freckles on each cheek. Number 3 does not come with a hairpiece. Number 4 has two black dot eyes and a smile, as well as a black moustache. He comes with a standard male hairpiece in black. Like number 4, this player has a black hairpiece, and comes with a face with two dot eyes and a smiling mouth in black. Number 9 uses the same face as Number 4, and comes with blonde hair. This player has a brown hairpiece, with black dot eyes and a smile. Number 11 has black hair. He has black printing on his face for dot eyes, a smile and eyebrows. This player has black dot eyes and a smile, and comes with a blond hairpiece. The goalkeeper's uniform differs from the other players. He has plain black legs with a grey torso. The front of the torso piece features sixteen silver circles outlined in black and arranged into a 4x4 configuration, getting the spacing getting wider at the bottom. The circles are broken up into columns with the use of three black horizontal lines. The back printing consists of a white number "1" outlined in black. The torso piece also has black hands, representing gloves. The goalkeeper's head piece is yellow, with brown printing outlined in black for hair, and black printing for downturned eyebrows, plain black eyes, stubble, a chin, and a mouth with a sneer. He also has a white hat as an accessory. The Green and White team were known to have taken part in a number of soccer/football training exercises and matches throughout their careers, often facing off against members of the Red, White and Blue team. Number 18 was known to have practiced his skills at least once with French national player Zinedine Zidane. A back view of Number 1, the goalkeeper. A back view of Number 4. Facts about "Green and White Team Player"
This page was last edited on 12 January 2016, at 22:53.